There are links below to the competition details and to the entry form. These links open PDF files. Why not have a go, I may well do so myself and will post my efforts here in due course. By the way, you can also find the entry form and more information on the Lincolnshire Churches Trust website. I’ve been busy with various projects here in the studio, so I haven’t had much time to just make paintings for me. However, a couple of winter tree scenes have fallen off my brush in the past few weeks and you can see them here. Shadows in the Lane. Watercolour 15ins x 11ins. on Arches 140lb rough paper. 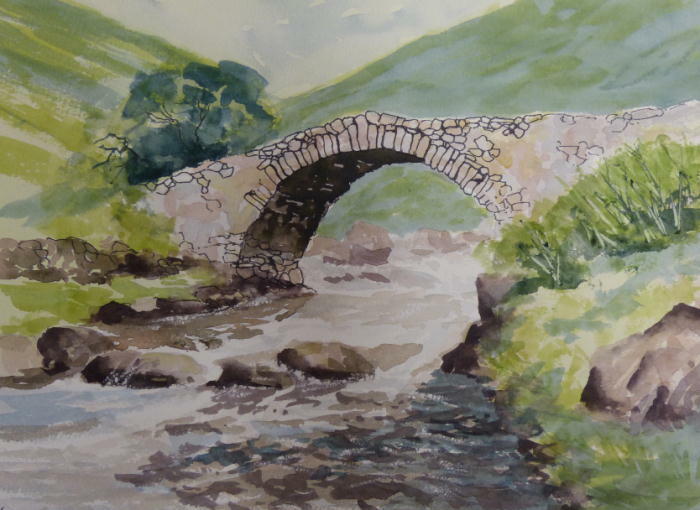 Both watercolours feature a very limited palette of colours. 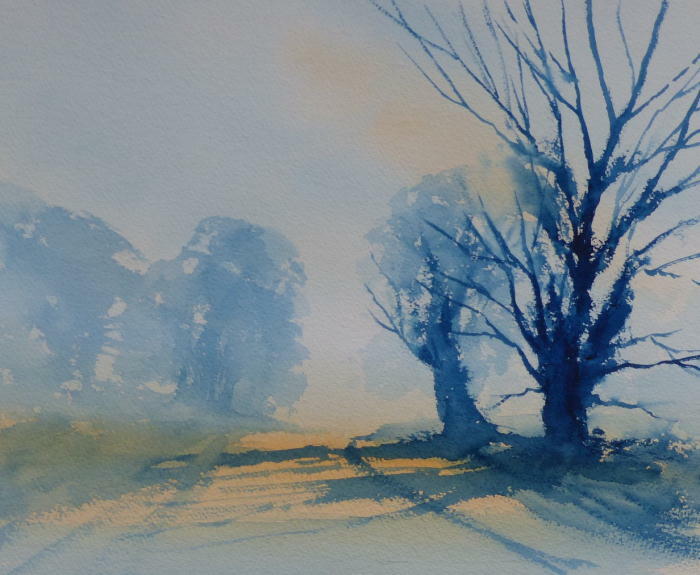 Shadows in the Lane uses Prussian Blue, contrasted with an orange mixed from Burnt Sienna and Lemon Yellow. Blue and Orange are two of my favourite complementary colours. 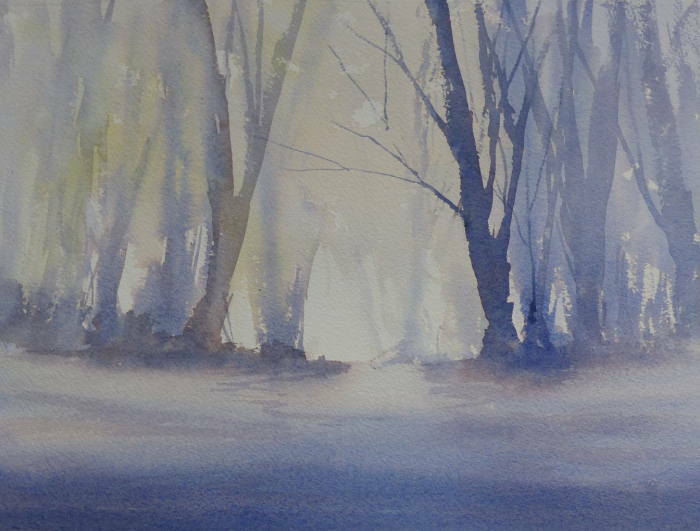 Sandringham Winter Trees is French Ultramarine Blue based, with touches of Burnt Sienna, Alizarin Crimson and Quinacridone Gold. Sandringham Winter Trees. Watercolour 15ins x 11ins on Arches 140lb rough paper. These are simple compositions, but they still need careful thinking about colour, tone and brushwork. Feel free to have a go at something similar yourself! Yes, it’s the 31st December, so this will definitely be my last post of 2018! The Dersingham Art Trail went well and I sold a painting – not one of my new works but one that I painted a couple of years ago which, unusually for me, is a still life. 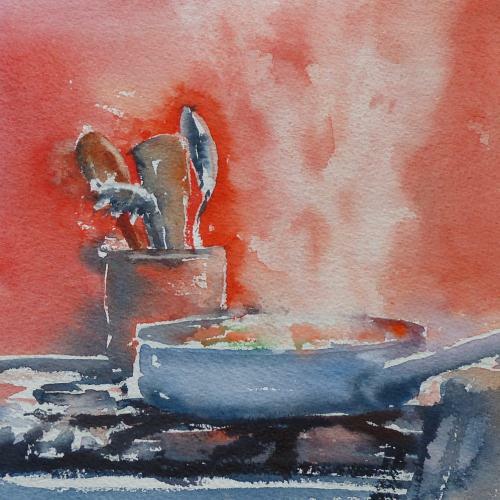 Well, I suppose it’s a still life as it does show a bit of action in the kitchen! Other good things from the Art Trail weekend were an order for several prints of my work, and a commission for a painting of . . . ah well I can’t tell you yet, as it’s a surprise gift. I will show you the finished work when it’s been delivered, but I’ve been working on it in the studio today and it’s coming together now. Another session or two and it will be ready for framing, I hope! Finally, to artists and art lovers everywhere, a very Happy New Year and may 2019 bring you everything you wish for. As you may have noticed, there haven’t been many new Blog posts lately. That’s because, apart from a bit of teaching, art has had to take a back seat for the past several months due to my involvement with the new Dersingham Village Centre, or village hall. The Centre is open now and I’m sure there will be art exhibitions there at some point in the future, but there’s still a lot of work to do, as with any new building. 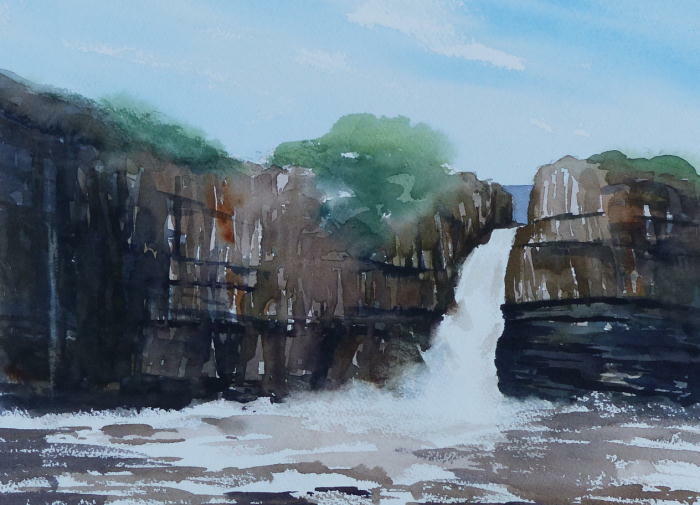 High Force waterfall, Teesdale. Watercolour 15ins x 11ins. However, the end of the year is always Art Trail time, with the Dersingham Art Trail members opening their studios to welcome visitors. This year’s event was last weekend and in the couple of weeks or so before it I managed to squeeze in some time in the studio to make a few new watercolour paintings to show. You can see them here, a couple of scenes from favourite locations in the North of England and one much closer to home, the Norfolk village of Great Massingham. The three paintings shown here are all for sale, so do get in touch if you’re interested. Or just enjoy looking at them! 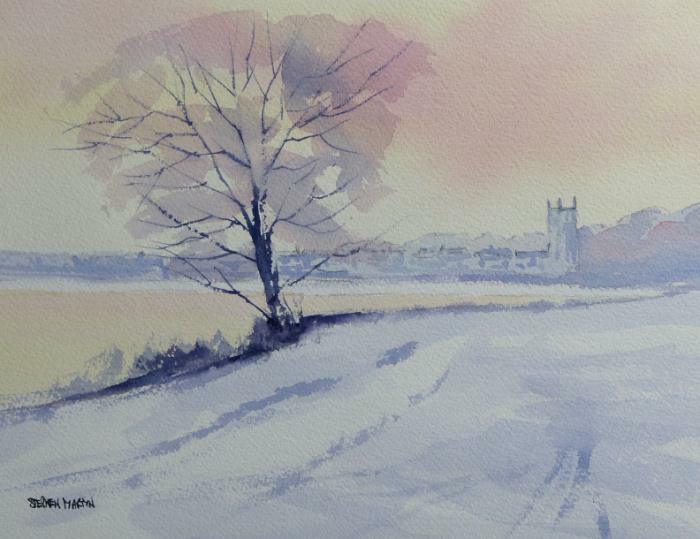 Snow at Great Massingham. Watercolour 15ins x 11ins. Amanda and Tracey are both watercolour students that I see on a one-to-one basic and they are both working hard and doing well! When they feel ready, I will post some examples of their work but in the meantime here are a couple of demonstration pieces that I’ve done for them. 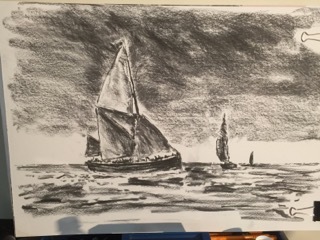 Amanda has been tackling the sunset at Burnham Overy Staithe and is now working on quite a challenging drawing of some more boats, this time at Thornham. Meanwhile, Tracey is also “at Thornham” working on this scene of the Coal Barn. Sunset, Burnham Overy Staithe. Watercolour 15ins x 11ins. Thornham Coal Barn and Boat. Watercolour 15ins x 11ins. 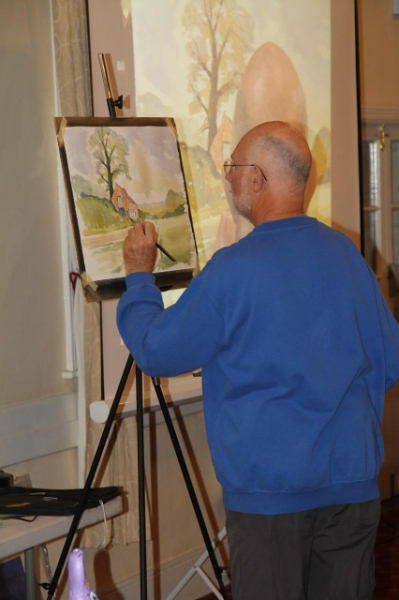 These subjects may seem simple, but they both require accurate drawing and confident handling of the paint. With practice, these skills can be learnt and are certainly not something that “you can either do or you can’t”. I’m sure that before long both Amanda and Tracey will be painting fluidly and confidently. If you think that I might be able to help you develop your painting and drawing skills then do get in touch via my Contact page. Yes, they don’t really go together, being at opposite ends of the country, but yet, in painting, terms, there are similarities. As I’ve written before, one of the themes that constantly recurs in my paintings is that of big skies and wide open spaces. Here you see two recent works that both embody that theme. Last Light at Thornham Harbour. Watercolour 15ins x 22ins. 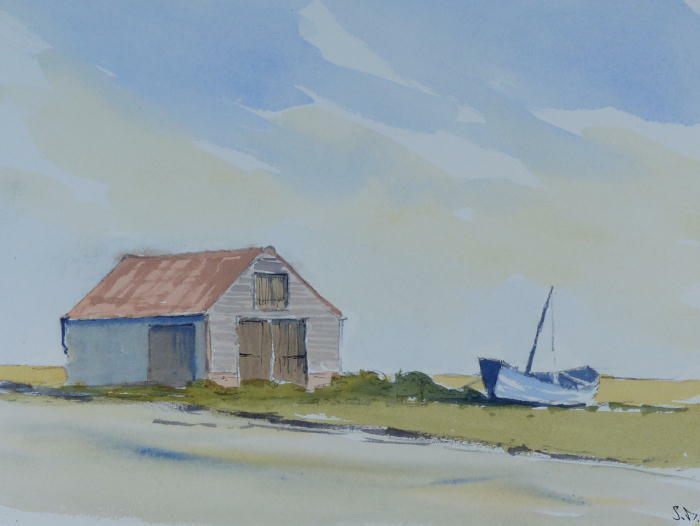 Thornham Harbour is just a few miles from my studio and I often paint views of it. Here I decided to focus on the incredible high tides that come into the harbour from time to time, often in the evening. The water in the creek just keeps on rising, flowing silently over the road until the famous Coal Barn is surrounded, like a stony island in shimmering sea. Pen-y-Ghent from the Pennine Way. Watercolour 15ins x 22ins. 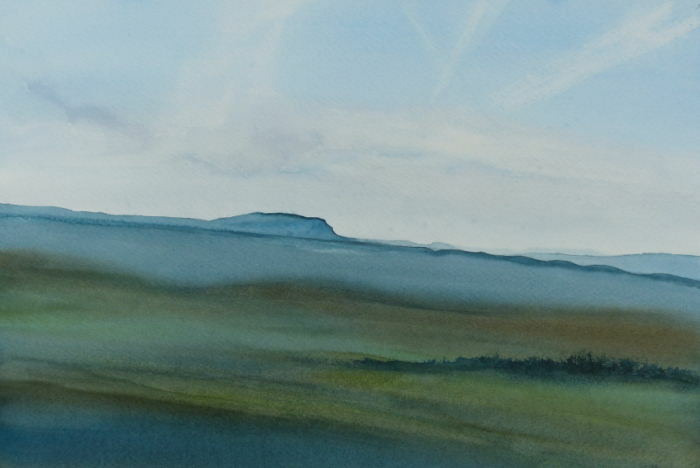 Further north, the Yorkshire peak of Pen-y-Ghent also stands like an island in a sea or greens and browns. It’s quite a few years now since I walked the Pennine Way, but I still like to revisit those scenes in paint. This view is taken from one of my photos that I took while walking the Way, between Horton-in-Ribbledale and Hawes. 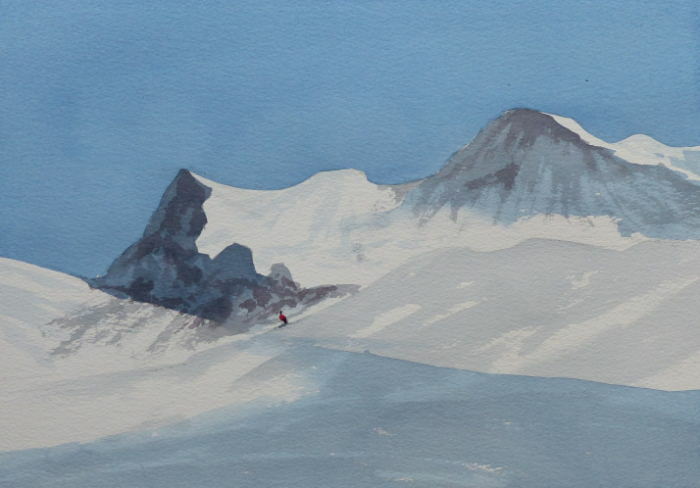 Well, not literally, but a painting of the Eiger anyway! This was a simple study that I did with one of my students who comes to the studio for one to one tuition. She had painted a mountain view in oils and I thought it would be nice to tackle a similar subject in watercolour. I had a photo of a Swiss train running on a line beneath the huge bulk of the Eiger, so we used that as a reference but left the train out and substituted a skier, or maybe someone snowshoeing, anyway a distant figure. This can be a great way of showing scale in a simple landscape painting, with the mountains towering above. Demonstration study of Swiss mountains. Watercolour 11ins x 15ins. The painting itself is actually deceptively simple, there are several stages to it, building up texture and tone on the mountains and the foreground. The main colour used is Prussian Blue, which is very transparent, allowing previously painted features to show through the washes. As someone once said, it’s like painting with coloured sheets of glass. The blue was modified in some of the washes to make various greys, adding a little Burnt Sienna and Quinacridone Red to the Prussian Blue. Probably the trickiest part of the painting was the first wash, the sky. To get a completely even wash requires several things. Plenty of watery paint, a large brush (I used a 1 inch flat sable and synthetic brush by Pro Arte) and practice. I turned the paper upside down and painted downwards from the top of the mountains to the top of the paper. A shallow angle on the board makes the paint run smoothly, we hope! Load the brush well, use the minimum of brush strokes and as soon as you reach the top of the paper, leave it alone! Take up any water that collects on the edge of the paper, using a damp brush or kitchen paper. Make sure the wash is completely dry before moving the board otherwise any wet paint will run back into the drying area and create a mark. Simple but quite effective. 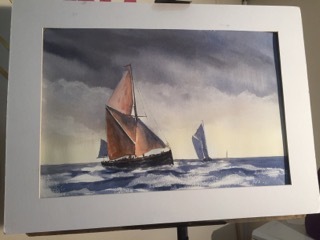 This painting was on a quarter imperial sheet of Waterford 300gsm NOT paper and using good quality paper like this certainly makes the job easier. Using the best quality materials won’t paint the picture for you, but it does help! I just thought I’d add a little gallery of paintings that I’ve made over the past few months. Eventually these will make their way on to my main website, but in the meantime I hope you will enjoy looking at them here. If you are interested in any particular work, please use the details on my Contact page to get in touch. Some of these paintings have already been sold, but I am always happy to paint something not the same but similar. I also sometimes have A4 sized prints available. Alone with the Sky, Hunstanton. Watercolour 11ins x 15ins. Geese over the Fields, Dersingham. Watercolour 15ins x 22ins. Well not quite on the waves, but painting them anyway! A couple of days ago I was at Castor and Ailsworth Society of Art, not far from Peterborough. It was an evening demonstration and I was looking for a slightly different type of subject to my usual landscape as I’d been to several Peterborough societies before and didn’t want to repeat myself. My charcoal planning sketch on A2 cartridge paper. 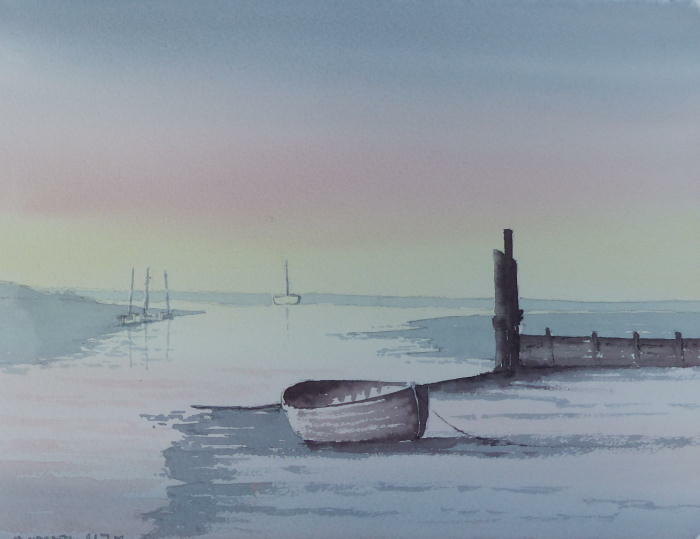 As luck would have it, I’d recently been asked to do a watercolour of a Thames barge, as a gift for some friends, so I thought that this might be an interesting subject to demonstrate. I began by planning the painting, using my favourite method of a large charcoal sketch. My photo that I was using as reference was just a close-up of one barge, so I added a couple of others in the distance to give the composition more balance and to add interest. The sky in the reference photo was also clear blue and as you can see, I changed that too! The watercolour demonstration painting. 15ins x 22ins on Waterford 140lb NOT paper. After the sketch was completed I then had to try and retain the composition and the tonal values in my watercolour painting. I used a very limited palette of colours, with Ultramarine Blue, Burnt Sienna and a touch of Raw Sienna. It can be a little tricky trying to paint and talk at the same time, and I might have liked to bring the dark clouds even lower, but overall I was pleased with the painting. Margaret and I were warmly welcomed at Castor and we really enjoyed our evening in this charming village. Hopefully we’ll see everyone again at some point in the future. Happy painting! 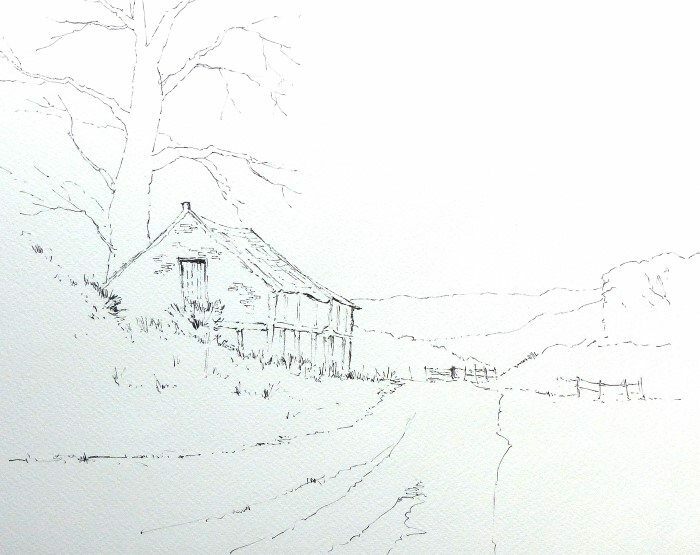 Old Barn near Ringstead – pen and wash. 15ins x 22ins on Waterford 140lb NOT paper. 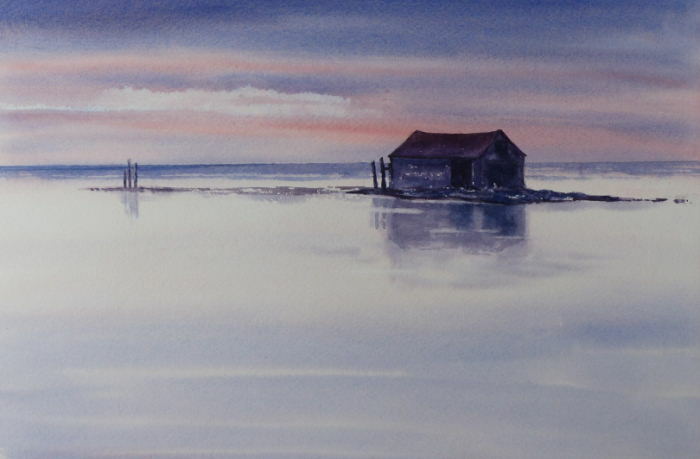 Just before Easter I was at Clare in Suffolk for a pen and wash demonstration evening. I’ve been to Clare Art Club before but not for a long time. A very friendly group, it was good to be back! I always enjoy the challenge of demonstrating in pen and wash. It’s a little tricky because the medium works best at a fairly small size, whereas art clun demonstration pieces are usually quite large, so that people can properly see them. I did this painting on a half-imperial sheet of Waterford NOT surface paper with a weight of 140lb or 300gsm. When I’m outside sketching in pen and wash I usually have a spiral-bound Bockingford sketchbook, about A4 in size. 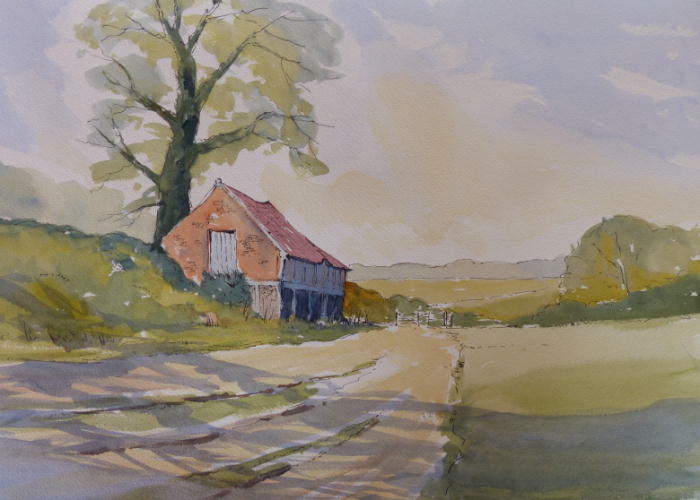 I chose a scene of an old Norfolk barn, not too far from my Dersingham studio. I sketched it in ink, using an Edding 1800 series pen, with an 0.7 tip. You can see the ink sketch here, although this one I did earlier in the day in my studio. You can’t have too much practice! Sketching the subject occupied me until the coffee break, after which I got busy with my paints. I used a simple palette of French Ultramarine Blue, Burnt Sienna, Raw Sienna, and Cadmium Yellow Pale. For the roof of the barn I used a mixture of Brown Madder with a tiny touch of Ultramarine, as I wanted it to contrast with the rest of the barn. All these paints were Winsor and Newton artists quality. I used a 3/4 inch flat brush for muck of the work, only dropping down to a number 8 round for some of the more detailed areas. If in doubt, use the biggest brush you feel comfortable with, it keeps your work feeling fresh and free. Total working time was about half an hour or so with the pen and the same with the painting. Pen and wash should be a quick, lively medium. A very enjoyable evening and a big thank you to Clare Art Club for making Margaret and myself so welcome. See you again in the future! A view of the back of my head! The demonstration painting is on the easel, with a projection screen behind me.